If you think that working in town means having to splurge on expensive meals, think again. 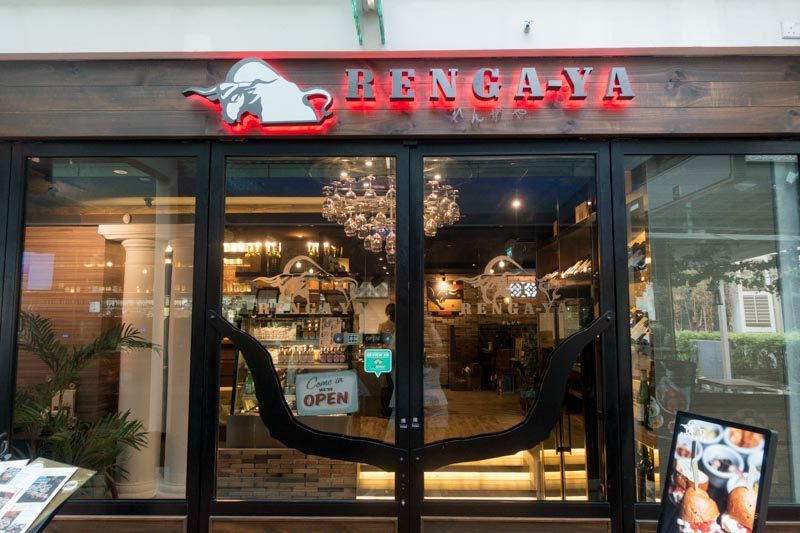 Renga-Ya, a Japanese steak & grill restaurant, launched its new lunch sets in November 2018. Not only are they wallet-friendly, but they’re also completely drool-worthy as well! Located in CHIJMES, Renga-Ya is famous for its marbled Ohmi wagyu and Hokkaido beef, which is imported directly from Japan and grilled on top of a charcoal barbecue for that perfect Insta-worthy sear. 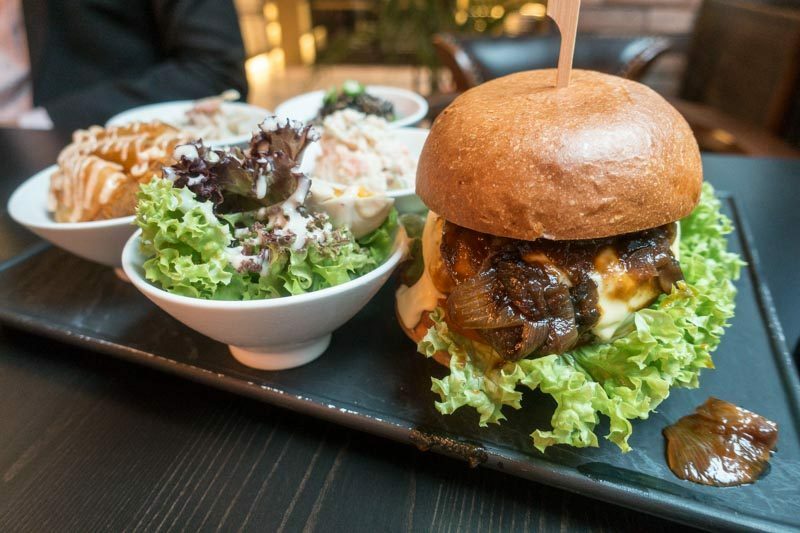 The six newly launched burger & sandwich lunch sets are catered towards the working crowd, who might prefer more affordable set meals as opposed to its stable barbecue dining options, which includes Wagyu Platter (S$89) and Pork Platter (S$39). When I stepped into Renga-Ya, I felt like I had entered a Texas-style bistro. 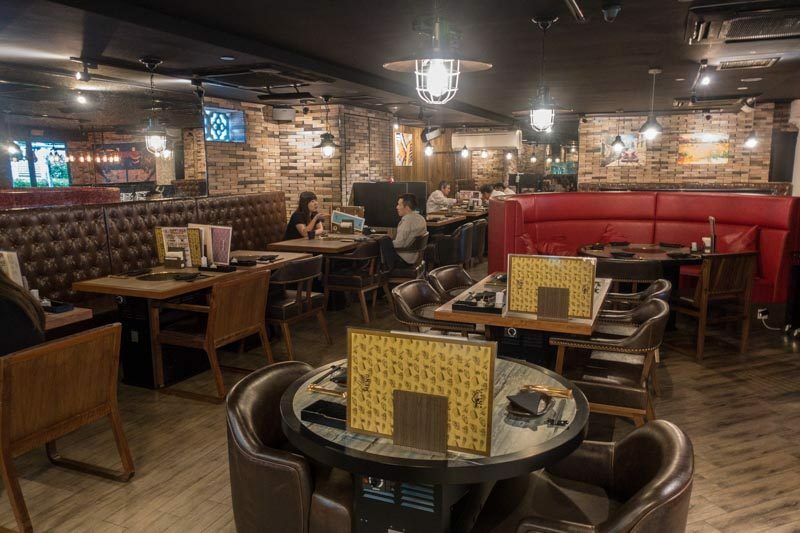 With tanned leather seats, dark oak tables, brick walls and occasional bursts of bright colours like red and mustard, it had zero vibes of a traditional Japanese charcoal BBQ grill restaurant. But I must say, the seats were well spaced out and staff were incredibly attentive, thanks to a useful buzzer on every table that alerts them whenever you need assistance. Because Renga-Ya is known for its beef, what I was really excited to try from its six new lunch sets was its Signature Wagyu Burger (S$18). Each lunch set comes with two complimentary sides, take your pick from unique Japanese-Western fusion dishes such as Mentaiko Mayo Wedges, Ajitama Ceaser’s Salad and Burdock coleslaw. Comprising a juicy and luxurious house-made wagyu beef patty, caramelised onions, demi-glace mushrooms, fresh lettuce leaves, tomatoes and a sweet Sriracha mayo sauce, I’m not exaggerating when I say that this burger patty melted in my mouth. It was that good. No doubt it was a messy affair because the juices from the wagyu patty were dripping onto my plate, but it was totally worth it. The wagyu patty weighed close to 200g, and we were also told that it’s so juicy because they made use of trimmed bits from the premium wagyu beef on the evening menu. They include wagyu fat in the patty to keep it tender and then flash grill it, resulting in a glorious beef patty that’s firm on the outside, but juicy, pink and utterly delicious in the middle. 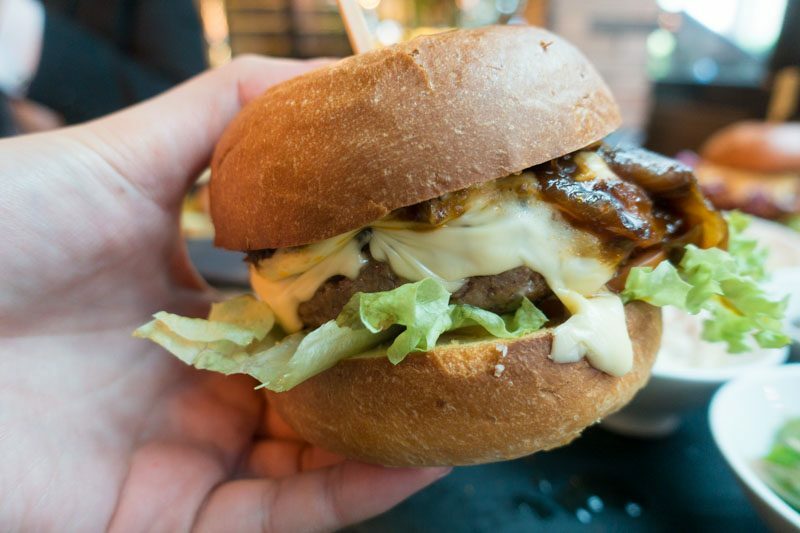 I’m a huge fan of mushrooms and caramelised onions, and the fact that Renga-Ya grilled their toppings so well that it was sweet with a slightly smoky aftertaste made this burger a huge hit for me. Though I personally loved the Signature Wagyu Burger the most, my dining partners couldn’t stop raving about how good the Seaweed Crispy Chicken Burger (S$12) was. 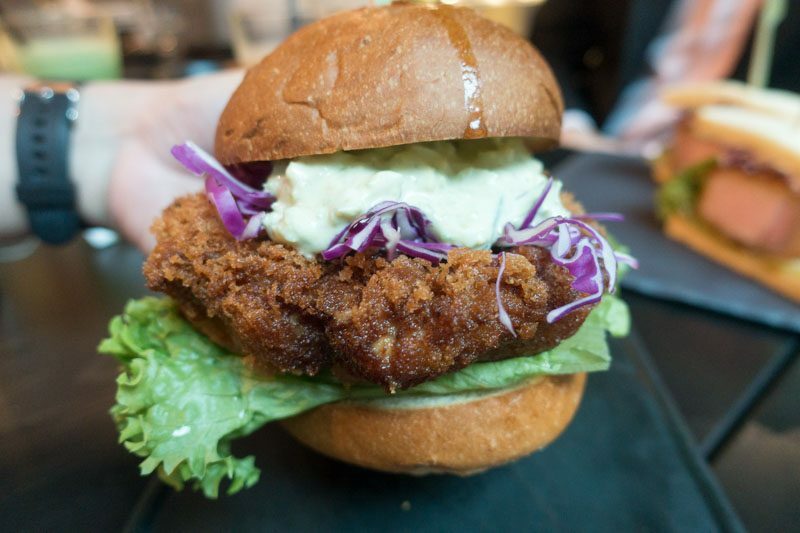 Encased in a fluffy burger bun, the deep-fried chicken thigh patty had been marinated in Japanese yoghurt and a secret spice blend before being topped off with yuzu sauce; garlic; togarashi and aonori sauce, which is marinated kombu and seaweed. The fried exterior was crusty and flaky, though a little oily, there was an audible crunch when I bit into the burger and the thick chicken thigh patty was incredibly sweet and juicy. The aonori sauce was luscious and creamy and resembled egg mayo, while little bits of garlic and togarashi added a slight tinge of heat and nutty smoky aftertaste. A playful nod towards the popular chirashi don trend, Renga-Ya’s Seafood Chirashi Toast (S$18) is made up of generous heaps of prawn, hotate, tuna and ikura on crispy toast. What I loved about the Seafood Chirashi Toast was the fact that they didn’t scrimp on the seafood. The marinated tuna came in large square chunks, glittering ikura pearls were piled on top of the mountain of seafood, and the prawns were fresh and sweet. Surprisingly enough, the crispy toast wasn’t soggy when we bit into it, thanks to the thick slices of cucumber that separated the seafood from the toast. 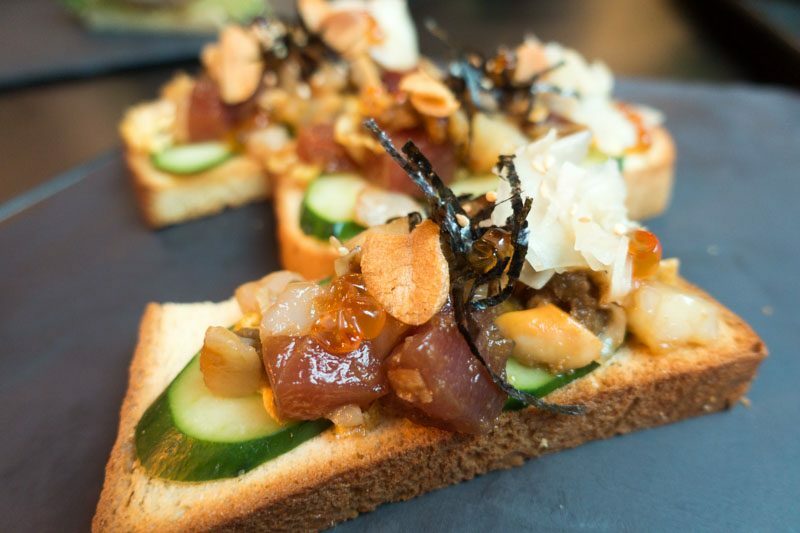 The delightful crunch of the toast went really well with the chilled sweetness of the seafood and cucumber, and I enjoyed the little bursts of ikura as it popped in my mouth. For big eaters, try Renga-Ya’s Jumbo Kagoshima Pork Katsu Sandwich (S$15). 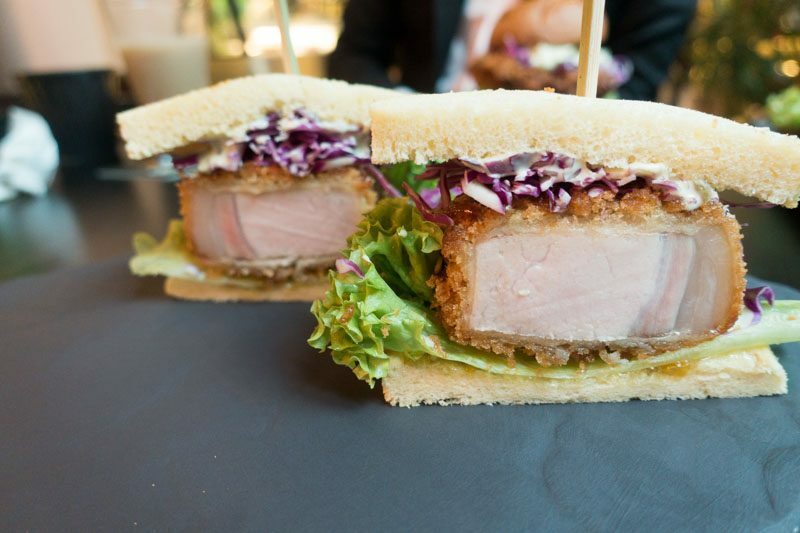 It’s an insanely thick pork chop sandwich — think pork katsu curry rice, without the curry or rice, and multiply the size of the usual tonkatsu by four times. It was so thick that I couldn’t fit the sandwich in my mouth, it had to be deconstructed. Accompanied with katsu sauce, yuzu jam and lettuce, this sandwich was really delicious. With a crisp salty exterior, the pork katsu itself was tender, springy and juicy. Together, the yuzu jam and katsu sauce was honey-like and zesty, which made every bite refreshing and appetising. 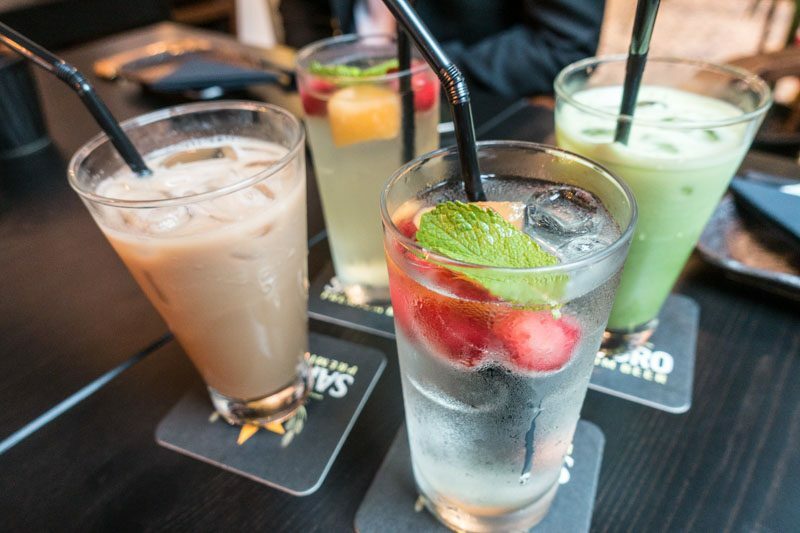 Top up S$2 for one of four drinks: Matcha Latte (Hot/Cold), Royal Japanese Milk Tea (Hot/Cold), Japanese Yuzu Fruit Tea and Japanese Peach Fruit Tea. Out of the four drinks, my favourite has got to be the Royal Japanese Milk Tea (Cold). With tea leaves specially imported all the way from Hyōgo Prefecture in Kansai, Japan, the taste of the authentic roasted tea leaves definitely came through. For just S$12 to S$18, I’ve got to admit, these Japanese burger and sandwich lunch sets are incredibly affordable. The portions were huge and super yummy (some days I still dream about that Signature Wagyu Burger) because of the experience this authentic Japanese charcoal barbecue restaurant has with wagyu beef and other Japanese dishes. Though the buns itself are nondescript, the heroes of the entire lunch sets have got to be the juicy, fat-dripping patties that are sandwiched between them. I’d say bring a friend or two so you can order different sets and share. This way, you get to try a variety of delicious burgers and sandwiches, and all at an affordable price to boot.